Contemporary Vietnamese Traditional Weddings – Modern traditional weddings in Vietnam differ significantly to those in the past. The most obvious change is the cost – the social pressure of ‘face’ leads some families to spend up to the equivalent of ten year’s salary. Another obvious difference is the average age of the couple. In the past, a groom of 20 with an 18-year-old bride would be considered an ideal couple. Today, education, a degree of female emancipation, and the need to pursue a career have raised the figures by five or even ten years for middle-class city dwellers. Working class couples tend to marry earlier. The tradition of matchmaking has largely faded away, but most parents have firm views – were they to decide that the prospective spouse was unsuitable, most young people would accept the verdict and break off the relationship. Some young people seek the services of an astrologer in advance to determine whether their future liaison will be successful. If the result were negative, most would withdraw. Women a couple of years over 30 are considered to be past their sell-by date – for men, it’s a about 35. The possibility of being left on the shelf is frightening, especially for women. As the deadline draws nearer, individuals’ and families’ criteria become looser – better an unsuitable partner than no partner! The first stage of marriage is usually when the young man’s parents consult a fortune-teller to see whether the couple is destined to live together as husband and wife. If so, he will formally request the young woman’s hand. The actual request is made by a party comprising the young man’s parents, or aunt and uncle if he is an orphan, and a go-between who go to meet the young woman’s parents. The party takes gifts such as betel leaves and areca nuts, and asks what the family requires for their daughter’s hand. The young woman’s parents will usually ask for a sum of money to cover the costs of the marriage preparations. The next stage in the process is the engagement, which, once the consent has been given, usually follows several months after. However, in some circumstances such as university or one partner working abroad, it can be much longer. Vietnamese people believe that some days are particularly auspicious, so choosing appropriate days for the engagement and the wedding is another task for the fortune-teller. If the fiancée or her family breaks off the engagement for any reason, all of the gifts must be returned to the young man’s family. If the fiancé backs out before the big day, her family keeps them. The engagement is a solemn ceremony. On the day, the young man will travel with his family to the young woman’s house bearing gifts of betel nuts, cake, wine, cigarettes and so on. Young women wear red ao dais and a banquet is held after formal rituals are performed before the ancestral altar. The engagement ceremony is a chance for the young woman’s family to meet their future son-in-law. The final stage is the wedding day. 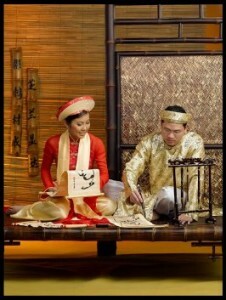 Traditionally, the couple must stay apart on the day before to prevent bad luck. On the night before, the bride’s mother will tend her daughter’s hair with several combs. Every comb means something, but the most important is the third comb – at that time she will ask for luck and happiness her new home. On the big day, the bride’s family and invited guests assemble at her house to await the arrival of the bridegroom. Shortly before the groom’s party is due, the bride slips away to don her wedding dress. The groom’s parents and immediate relatives are preceded by an odd number of young men smartly dressed in shirt and tie, and dark trousers. They each carry a tray covered in a red cloth, or alternatively a large red and gold canister, containing gifts of betel leaves, areca nuts, wine, fruit, cakes, tea and so on. In the past, they would have walked, but today most wedding parties opt for cars and change to cyclos for the last part of the journey. Red is the dominant colour in a traditional Vietnamese wedding – it’s considered a lucky colour and will lead to a rosy future. Upon arrival the young men dismount and are met by the same number of young women dressed in red ao dais. The men hand the gifts to the women who take them inside. Each young woman hands her male counterpart a small amount of money to designate that they are ‘working’ – there is a superstition that being an unpaid helper at a wedding will mean that you won’t marry. The leading couple of the groom’s party enters the bride’s house carrying a tray of small cups of wine and invite the brides parents to take a sip. By accepting the toast, the bride’s parents symbolically agree to admit the groom’s party. A few years ago, this would be accompanied by firecrackers, but many accidents and a subsequent ban put an end to the tradition. The groom’s family introduce themselves and ask permission for their son to marry his bride. A Master of Ceremonies (usually a respected person chosen from the bride’s relatives) instructs the bride’s parents to present their daughter. The bride then enters. Traditionally, this will be a red au dai. The groom will wear a dark suit or, more traditionally, a black ao dai. The wedding ceremony begins in front of the altar. The bride and the groom kneel down and pray, asking their ancestors’ permission to be married and their blessing on their family-to-be. The couple then turn around and bow to the bride’s parents to thank them for raising and protecting her since birth. They then bow their heads towards each other to show their gratitude and respect to their soon-to-be husband or wife. The Master of Ceremonies then advises the wedding couple on starting a new family and the two sets of parents take turns to share their experiences and give blessings. The groom and the bride then exchange wedding rings, and the parents give the newly wedded couple gold bracelets, earrings and other valuable gifts. After the marriage, both wedding parties leave to join guests that were not invited to the marriage ceremony at a large banquet. This is usually a large gathering, often in the hundreds and sometimes more. The groom, bride, and their family are once again introduced to the guests and everyone drinks a toast. Dinner or lunch is served at the table. During the reception, the groom, bride, and their parents visit each table to thank their guests. In return, the guests give envelopes containing wedding cards, money gifts and a blessing to the newly wedded couple. After the banquet, the groom’s party and the bride leave for the groom’s house, where she will live. Later, the bride’s party follows to inspect the accommodation – particularly the marital.